Esophageal Adenocarcinoma in a 40-Year-Old Man With Cystic Fibrosis: Coincidence or Not? Objective To report a case of esophageal cancer in an adult patient with cystic fibrosis (CF) and review the relationship between these 2 diseases. Case Report A 40-year-old man with CF presented with worsening epigastric pain, weight loss, and upper gastrointestinal (GI) bleeding. Endoscopy revealed innumerable masses in the distal esophagus. The workup revealed esophageal adenocarcinoma metastatic to the liver and the lungs. 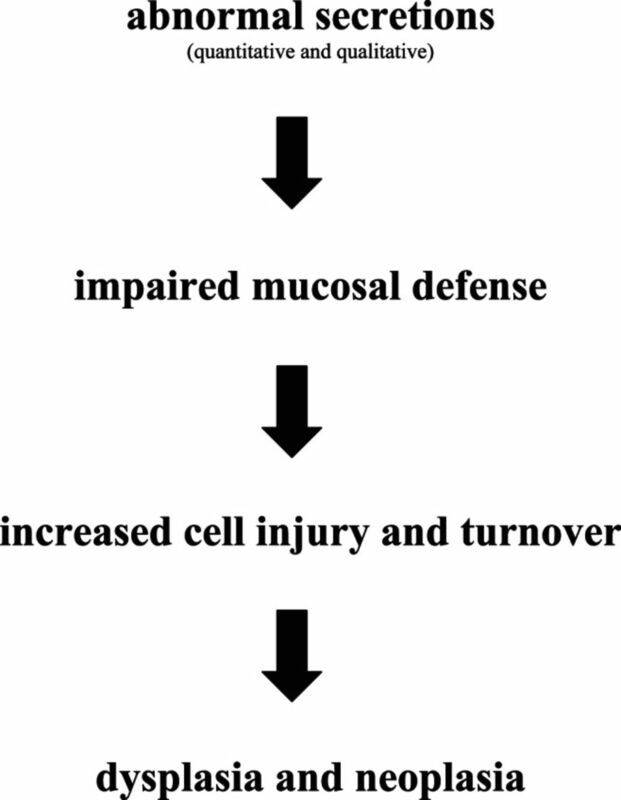 Discussion Abnormal mucous secretions in CF patients impair the innate GI mucosal barriers. The incidence of both gastroesophageal reflux disease and GI malignancies is higher in patients with CF. Patients with CF now survive long enough to potentially experience the consequences of long-term acid exposure, including esophagitis, Barrett esophagus, and esophageal cancer. Conclusion Our case report adds to a small but growing body of evidence that CF is a significant risk factor for GI malignancies, including esophageal adenocarcinoma. Controlled studies are needed to determine whether a causal relationship truly exists. Cystic fibrosis (CF) is an autosomal recessive disease in which abnormally viscous mucous causes dysfunction in the respiratory and gastrointestinal (GI) systems. The primary defect is a mutation in the cystic fibrosis transmembrane conductance regulator (CFTR) protein, most commonly a deletion of phenylalanine at position 508 on chromosome 7. This mutation results in abnormal chloride, sodium, and bicarbonate ion transport across epithelial membranes, causing secretions to become viscous and poorly soluble. The CFTR mutation carrier rate among Caucasians is approximately 1 in 28, and the disease is present in approximately 1 in 3,200 individuals. CF is less common among blacks (1 in 15,000), Hispanics (1 in 9,200), and Asians (1 in 31,000).1 Figure 1 shows the downstream gastrointestinal manifestations of CFTR-related mucosal abnormalities. Key factors in the proposed mechanism of the development of gastrointestinal malignancies in patients with cystic fibrosis. In the respiratory tract, abnormal mucus in patients with CF interferes with ciliary function and clearance of bacteria, contributing to chronic inflammation, bacterial colonization, and recurrent infection. In the GI tract, abnormal secretions affect the small and large bowels, the pancreas, and the biliary system. Hyperviscous mucus in the intestine can cause thick meconium and stool, leading to meconium ileus, distal intestinal obstructive syndrome, or intussusception. Intestinal inflammation is potentiated by delayed transit of food and bacteria, inadequate buffering from bicarbonate-poor pancreatic secretions, high concentrations of bile acids in biliary secretions, and exposure to exogenous pancreatic enzymes. In the pancreas, thickened secretions become inspissated and obstruct the ducts, causing pancreatic atrophy, chronic pancreatitis, and malabsorption of fat and fat-soluble vitamins. Similarly, thickened bile blocks intrahepatic ducts and can lead to cholestasis and cirrhosis with portal hypertension and hypersplenism. Patients with CF comprise 3.5% of all pediatric liver transplants.2 Less is known about CF-related end-stage disease in the mucosa of the alimentary tract. A 40-year-old man with CF experienced progressive dyspnea over a 1-week period without fever or productive cough. His symptoms did not improve after using inhaled albuterol at home. He previously had only minimal dyspnea on exertion and had never been admitted to a hospital or intubated for CF. He presented to our hospital in acute respiratory distress with marked hypoxia and acidosis. He was intubated and admitted to the intensive care unit. Placement of an orogastric tube yielded 2 liters of dark red blood. Further history revealed that the patient had experienced worsening epigastric pain over a 6-month period despite using hydrogen-receptor antagonists, proton-pump inhibitors, and sucralfate. He had lost approximately 20 pounds over this 6-month period. He rarely drank alcohol and was a former smoker with no family history of GI or pulmonary disease, including CF. Additional home medications included ciprofloxacin and nebulized tobramycin. He did not take aspirin or nonsteroidal antiinflammatory drugs. Physical examination revealed a thin Caucasian male who was intubated and minimally responsive. Vital signs showed a normal temperature but tachycardia, hypotension, tachypnea, and hypoxia. The abdomen was moderately distended with hypoactive bowel sounds. The hemoglobin was 4.0 g/dL, alkaline phosphatase 294 U/L, aminotransferases less than 2 times the upper limit of normal, and bilirubin normal. The albumin was 1.3 g/dL. Upper endoscopy revealed masses from the mid-esophagus to the gastroesophageal junction. The masses became larger and more confluent at the gastroesophageal junction and extended into the gastric cardia (Figures 2A-2B). Biopsies revealed moderately differentiated adenocarcinoma (Figures 2C-2D). 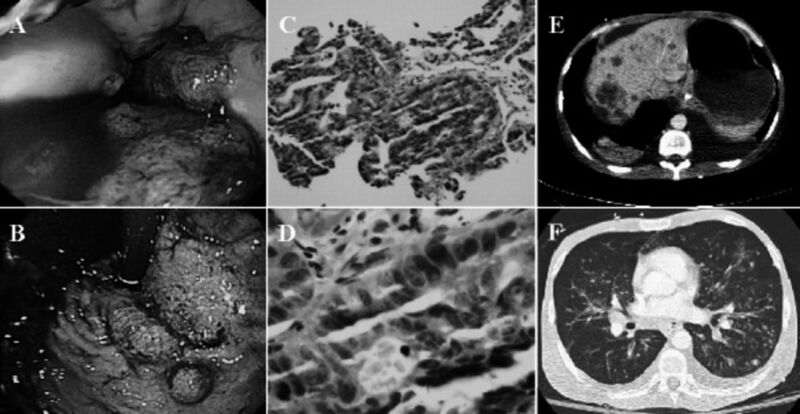 Computed tomography of the chest and abdomen revealed multiple metastatic lesions in the liver and lymphangitic spread of the tumor throughout the lungs (Figures 2E-2F). The patient stabilized and was extubated but ultimately declined palliative chemotherapy. He died at home several weeks later in the presence of his family. Adenocarcinoma of the distal esophagus and gastroesophageal junction in a 40-year-old patient with cystic fibrosis: (A) mucosal lesions in the mid-esophagus, (B) confluent tumor extending into the gastric cardia, (C) low-power hematoxylin and eosin stain showing multiple irregular gland-like structures, (D) high-power hematoxylin and eosin stain showing overlapping cells with atypical nuclei, (E) abdominal computed tomography with liver metastases, and (F) chest computed tomography with lymphangitic spread of tumor. Evidence shows that gastroesophageal reflux disease (GERD) is more prevalent in patients with CF than in the general population. Scott et al3 showed that screening yielded a positive response for GERD symptoms in 26.5% of children with CF versus 5.6% of their healthy siblings. Blondeau et al4 reported that among 33 pre- and post-lung transplant patients with CF, 28 patients, or 85%, had gastroesophageal reflux by impedance-pH manometry. Even CF patients without GERD symptoms may have a significant incidence of reflux. Button et al5 demonstrated that 24-hour esophageal pH monitoring in 24 pre- and post-lung transplant patients with CF revealed abnormally high esophageal acid exposure in 21 patients, or 88%. These reflux episodes were asymptomatic in 8 patients, or 33%. Potential mechanisms for the increase in GERD among patients with CF include frequent coughing with alteration of the thoracoabdominal pressure gradient, abnormal basal lower esophageal sphincter (LES) tone, and inappropriate relaxation of the LES. However, when Cucchiara et al6 measured esophageal pH and manometry in 14 patients with CF and GERD symptoms, a majority of reflux episodes were caused by inappropriate LES relaxation. The patients with documented reflux episodes did not have decreased LES basal tone or a disturbance in the thoracoabdominal pressure gradient. An increase in the incidence of BE in patients with CF would suggest a causal relationship between the increase in esophageal acid exposure and esophageal adenocarcinoma. Unfortunately, the literature on the incidence of BE in patients with CF is restricted to case reports,9 likely because the progression from BE to neoplasia occurs over several decades and CF patients with GERD have historically not survived this long. Healthcare providers may attribute GERD symptoms to pulmonary rather than GI causes and thus defer further workup or may be hesitant to pursue upper endoscopy because acute or chronic respiratory disease increases the risks associated with this procedure. Two studies by El-Serag et al aimed to determine the prevalence of BE in children and adolescents. Of 402 children undergoing endoscopy at a single center, 2.7% had suspected BE.10 However, a subsequent multicenter review of endoscopic findings among 6,731 children found suspected BE in only 0.25%.11 The presence of intestinal metaplasia was not confirmed by histology, and the incidence of CF was not reported in either cohort. Neither study included children with developmental delays or neuromuscular disorders, which are associated with a higher incidence of GERD. As in CF patients, the incidence of BE in these special populations has not been described. Patients with CF not only have more GERD than controls, but they also appear to be at greater risk of developing GI malignancies (Table).12 Two large retrospective analyses have shown relative risks for digestive tract cancer of 6.4 and 5.1, respectively.12,13 The average age at diagnosis of GI malignancy for CF patients was 32.2 years in 1995, 26 years younger than in the general population.12 At that time, the average life expectancy of CF patients was approximately 30 years; that expectancy is now nearly 10 years longer. In addition to the present case, the number of reported cases of both GI and liver malignancies in children and adults with CF has been increasing, but no further large cohort studies have validated or updated this risk. Because patients with CF live longer than in previous eras, they experience more downstream effects of CFTR-related mucosal abnormalities. Patients with CF have more GERD because of inappropriate relaxation of the LES. Limited data suggest that CF patients are at higher risk for GI malignancies, but the literature is currently limited to only case reports on BE in CF patients. Thus, the possibility that a causal relationship exists between GERD and cancer remains unaddressed in this population. Our case of a 40-year-old man with CF and esophageal adenocarcinoma emphasizes the need for studies that might better define the risk of GI malignancies in CF patients with or without GERD. Screening endoscopy in high-risk patients with CF, as routinely performed in groups at risk for gastric or esophageal cancer, may in the future be able to prevent outcomes such as the one suffered by our patient. (2, 1998) Comparison of the clinical manifestations of cystic fibrosis in black and white patients. J Pediatr 132(2):255–259, pmid:9506637. (4, 2003) Liver transplantation for cholestasis associated with cystic fibrosis in the pediatric population. Pediatr Transplant 7(2):93–97, pmid:12654048. (2, 1985) Gastroesophageal reflux in patients with cystic fibrosis. J Pediatr 106(2):223–227, pmid:3968609. (8, 2008) Gastro-oesophageal reflux and aspiration of gastric contents in adult patients with cystic fibrosis. Gut 57(8):1049–1055, pmid:18372497, Epub 2008 Mar 27. (10, 2005) Gastroesophageal reflux (symptomatic and silent): a potentially significant problem in patients with cystic fibrosis before and after lung transplantation. J Heart Lung Transplant 24(10):1522–1529, pmid:16210125. (5, 1991) Mechanisms of gastro-oesophageal reflux in cystic fibrosis. Arch Dis Child 66(5):617–622, pmid:2039253. (3, 2004) Duodenogastric bile reflux is common in cystic fibrosis. J Pediatr Gastroenterol Nutr 38(3):312–316, pmid:15076633. (11, 1996) Role of acid and duodenogastroesophageal reflux in gastroesophageal reflux disease. Gastroenterology 111(5):1192–1199, pmid:8898632. (11, 1993) Barrett's esophagus in children with cystic fibrosis: not a coincidental association. Am J Gastroenterol 88(11):1934–1938, pmid:8237944. (12, 2001) Extraesophageal associations of gastroesophageal reflux disease in children without neurologic defects. Gastroenterology 121(6):1294–1299, pmid:11729108. (11, 2006) The prevalence of suspected Barrett's esophagus in children and adolescents: a multicenter endoscopic study. Gastrointest Endosc 64(5):671–675, pmid:17055854. (2 23, 1995) The risk of cancer among patients with cystic fibrosis. Cystic Fibrosis and Cancer Study Group. N Engl J Med 332(8):494–499, pmid:7830730. (3 5, 2003) Cancer risk in nontransplanted and transplanted cystic fibrosis patients: a 10-year study. J Natl Cancer Inst 95(5):381–387, pmid:12618503. You are going to email the following Esophageal Adenocarcinoma in a 40-Year-Old Man With Cystic Fibrosis: Coincidence or Not?